Expectations make us weird. : I Don't Know Why I Play This: How Modern Gamification and Groupthink Change Our Play - What about channel 4? Posted under Expectations make us weird., No Mans Sky, BioShock 2, Monster 4X4, Happy Feet Two, I actually thought BvS was alright. If you have yet to play it, you probably know No Man's Sky for two things. First, for the gigantic expectations surrounding it. And two, if you believe a collective online mantra, an apparently gigantic let-down. I'll be direct; if you are caught up in the first, you may fall into the second. Not because No Man's Sky is not worthwhile, but because that's just how expectations tend to play out. Considering four out of five members of our family are hooked on No Man's Sky (and the fifth is too young to play, so he just watches) it is safe to say our house has an incredibly positive opinion of the game. But I'm not writing this to repeat Crabby's excellent article about enjoying a game despite a common antagonistic theme against it. And anyway, No Man's Sky is doing well and already has some ardent defenders. I'd like to write about what my boss said when I asked if he had yet played No Man's Sky: "Yes," he sighed, "Way too much. I've spent so long playing that game already. I don't know why I keep playing it." He's also said the same of his time in World of Warcraft and a few mobile games he plays frequently. It's odd, right? I've heard of a PC gamer who spent over a hundred hours in No Man's Sky and then asked for a refund because it didn't live up to expectations. Battlefield 1's recent Beta once again brought out the Battlefield and Call of Duty fans who will complain endlessly about different aspects of said games, after spending dozens or hundreds of hours playing them- and they continue playing! I hope it goes without saying that I'm not against being critical or complaints with legitimate issues with games. But, is it common to spend such huge amounts of time into an entertainment activity and come away vehemently against it? I don't think the folks who hated the film Batman Vs Superman: Dawn of Justice went to go see it several more times. If you hate a music album, you're not likely to listen to it more than another time or two, if at all. Yes, many video games progressively develop and sometimes what starts slow all comes together, but I'm referring to the folks who spend more than just a few hours trying it out. Personally, I think if the first ten hours of a game isn't doing it for you and you spend another ten hours with it, maybe blaming the game after that is no longer redundant, but kinda silly. What? What'd I do? Image from Iparchive.org. So why is this something we see more in video games than anything else? After all, a game doesn't have to justify its existence since it is, by definition, inherently unnecessary in the first place. Even beyond the more recent acceptance of video games as artistic expression, and the realization of their place in historical and contemporary cultural development, video games largely exist to entertain; they are a leisure product. That doesn't eliminate their inherent value, but it cannot be denied that they have been and always will be at best an unnecessary addition to things we actually need. Spending large chunks of time being entertained is one thing, but spending that time with an entertainment product (when to be entertained is still the goal) while admittedly not being entertained is, put kindly, rather strange. Why do we see it, and see it more often? I'm theorizing it has to do with the two recent developments of gamification and the internet groupthink narrative. The fact that there is a meme on groupthink is so meta that my head hurts. From memes.com. First, it cannot be discounted that the internet introduces a groupthink narrative. While not new, it has certainly become commoditized. When it comes to funding, problem solving, or resource compilation, there are countless benefits to how social connection technologies have developed our world. Unfortunately, like any technology, there are problems introduced as well. Sometimes a snowballed, negative 'groupthink' identity attaches to a game or series. "Unnecessary sequels," "should be free-to-play," and "dumbed down for casuals" are concepts that, once attached, can tank interest and sales for a video game. Some of my favorite gaming experiences are with games I'd never have played had I listened to popular narrative, or if that narrative replaced my own interests. I don't defend BioShock 2, an "unnecessary sequel," because I'm easily entertained; I defend it because I found the story to be a mature development of the themes presented in the first game, plus it was fun to play. I never found Evolve lacking content or fun, and while a free-to-play model is welcome if it gets more players to have fun, I have sympathy for the talented developers who read forums demanding their hard work be given away. One of my middle son's favorite games is Happy Feet Two. Modern thought has a triple condemnation for this one; a sequel, a license game, and a motion-control Wii game. It is unfortunate that many would tell my son that he's having the wrong fun. My 8 year old enjoys this so much even WB's marketing is surprised. Pic from Gamefaqs. In fact, the same kiddo loves his Monster 4X4 3DS game. Even though he owns and enjoys Mario Kart 7, which is objectively a better game in every sense, he plays and enjoys Monster 4X4, a game that has been reviewed as one of the worse games on the 3DS. My son enjoys it and he doesn't even have a thing for monster trucks; he, like his dad, just finds games he finds fun and enjoys them regardless of anyone else's opinion. He doesn't spend time on internet forums and game review sites. He doesn't feel the need to explain why he enjoys what he enjoys. It is the purest form of video gaming for the sake of fun; he just enjoys what he enjoys. Do I enjoy it? Ah, no. Not at all. I showed him Mario Kart 7, and he liked it too, but it didn't diminish his Monster 4X4 enjoyment. Cool by me! My other theory is how gamification has, well, turned everything into a game. And because of the success of gamification, that is how we see everything around us: Fitness. Career development. Dating. Fundraising. Banking. Mental Health. Traveling. If there is a method to attach numbers, track progress, set specific goals, compete, or otherwise make a game out if it, that's how it is done nowadays. That's not necessarily a bad thing! The problem is, when everything is a game, what happens to gaming for the sake of gaming? If we cannot measure the benefit, if we cannot directly track the progress, if we have no measurable 'fun' of what we are doing, it is much easier to lose interest in a world that demands everything must be quantified and set to progressive, competitive numbers. This was apparent to me years ago when I was caught in the meta-game of Xbox achievements. At my peak of Gamerscore hunting, I had stacks of non-360 games I really, genuinely wanted to play. Yet I would often spend time on games that bored me, or more time with games I felt I wanted to be done with, all because of that meta-score. I wasn't even actively competing for Gamerscore with a friend or anything; I just thought that overall number represented my entertainment net-gain. It wasn't a specific game or system that finally broke me out of the several-year habit. It just sort of happened. Suddenly, I realized I no longer enjoyed video games themselves, I was playing them for the sake of a number that honestly didn't matter to me. I took a few months hiatus, and then started playing games for other systems again, and began to remember why I fell in love with video games in the first place. Now I unabashedly play on easy mode for many games. I open every game, toy and bonus item I get in order to remove any temptation to keep it only for resell value. I make a point to play anything I have interest in regardless of reviews or internet opinions. And you know what? I enjoy video games now more than any other time in my life, rekindled from those happy childhood memories of a C64, NES, 2 liter of Coke, an overnight friend or two, and a whole Friday night stretching before me. Gaming for the sake of gaming is a refreshing alternative. Perhaps achievements and trophies bring you that kind of joy. If you play for them, I hope so! Maybe you always give a chance to games you are curious about regardless of popular opinion, sequel-itis, or fanboyism. I hope so! Perhaps you can enjoy a game without some extra quantification explaining how entertained you are. If so, sell me your gaming PC! If you ever find yourself playing a game and end up asking yourself, "Why am I playing this? ", I hope you give one of two replies. Maybe it's because you're having fun! Just not the kind of fun you were expecting, or can immediately quantify. And if you honestly really are not having fun, there's so much out there that I hope your reply is, "Next!" Great article, man! I must admit, I fall into this trap occasionally, though I tend to care very little about what others think, so my susceptibility is more a symptom of getting caught up in the hype of something than feeling like I have to go along with the crowd. I have fallen victim to the collective mantra of "casual/mobile = bad". Still, it's important to understand this idea of "group think" and he danger of it. Not to digress too much, but this has become prevalent in politics of late, where the general consensus is that if you don't vote for Hillary Clinton, it's automatically a vote for Donald Trump, and vice versa. As if individual assessment of things is no longer valid, or one's own knowledge of politics and issues can wholesale be discounted because they plan to vote for "the wrong candidate". Critical thinking has taken a hit in culture over the last few years, and as you illustrate above, gaming culture has not been immune to that trend. I've become disgusted with the group think that has come up against Nintendo with the Wii U. People look at me weird when I say the only current gen console I have is a Wii U, and that I don't plan to buy a PS3 or XB1 until the games I want are available on the cheap. They minimize my decision, and feel like they have to explain away my choice because, "Sure a real gamer wouldn't own just that one lame Nintendo console." Suddenly, my individual gaming experiences, which should be my focus, since it's MY CHOSEN HOBBY I'm engaged in, have no weight and are meaningless. But the crux of the matter is, I've put more time into The Wonderful 101 and Bayonetta 2 than most anything else in the last 4 years of gaming. Yeah, I put a lot of time into inFAMOUS when I first got my PS3.......3 years after the game's release! I also put a lot of time into inFAMOUS 2...2 years later, again, 3 years after its release. I didn't have to play it when it was shiny and new. I did with the Wii U, but that's because the games coming out for it intrigued me, and I wanted to experience those sooner rather than later. In short, I think gamers need to get back to playing games for fun, and stop caring what everyone else thinks. Really good article. I ask myself "am I having fun?" more and more as I play games. Often, the answer is no and I try to stop. It's not always easy. I do often fall into the achievement trap, and for a long time I took pride in the fact that I complete the majority of games that I play. However, if I'm not having fun (or learning something, or being made to think) then what's the point? Right now my biggest problem is with never ending games. I played World of Warcraft for 9 years, realised I was rarely having fun 7 years in and took 2 years to extract myself. Now it's Overwatch, which is in turns great fun and greatly frustrating. It's hard to balance going for some goal with wanting to play a wide variety of things and only play things that you're actually enjoying. Great article! I have found myself being swept up in hype or listening to everything from the internet hive mind and it's exhausting. I was recently able to separate myself from the meta by playing some PC Engine games with the simple goal of enjoyment. When I played through Sturmwind I realized that I play games for entertainment and as you stated if I'm not enjoying it I need to move on. It will be interesting to see if in five to ten years time Might No 9, or No Man's Sky are considered hidden gems. I could write a long list of complaints I had about Batman V Superman (Amy Adams was not one of them), but ultimately it doesn't matter because the tl;dr version is "I liked it." That said: I don't get the hate for Suicide Squad AT ALL. That movie is awesome. also let me know if you need some PC parts - I have a lot of extras haha. @MetalFRO:Oh man, is the groupthink thing ever a problem in politics. I agree and know exactly what you mean. And even though we have an XB1 and PS4, our Wii U (both of them) get more playtime than anything else. We absolutely love it, and it is the only recent system we're collecting for just to get the library before it gets more scarce. It's a shame folks look down on the system so much, as we have so much fun with it. The NX could be a toaster with a button on it and I'd give it a try. @Pam:I hear ya. I typically only play never-ending games if I have a group to play with (currently Overwatch and Star Trek Online for PS4.) I have so, so many games I want to play that if I'm not engaged with something and have only artificial reasons to keep playing, I step aside and consider if it is worth continuing. Humans are such habit engines. @Addicted:The PCE/TG16/CD has such an excellent library, right up my alley as well. Shmups, RPGs, action, puzzle, and most with a heavy Japanese flair. Big, big fan. I think, sadly, MN9 will fade away, and NMS will be known like Spore; heavily hyped, many disappointed, a handful of supporters. It hit a landmark at our home as being the first 'single' player game everyone wants to play, and I know it will have infamy in our family memories. @noiseredux:Yeah, I liked BvS and SS too! Not the greatest movies, but fun and worthwhile. I like how different the DC movies are than the Marvel, and I personally think there's plenty room for both. I don't have the Snyder hate many folks do; I thought Watchmen was excellent, and that's coming from a fan of the graphic novel long before the movie. To each their own, but I'd sure like it if I weren't demeaned for my opinions! And unless those PC parts work on a Surface Pro and Pro 2, thanks but those are the only things we have besides an old DOSbox. I have a third theory that you kinda touched on in your second theory, but I'd like to expand upon it. Sometimes we subconsciously see games as work, or a job that needs to be completed. This is because in modern games there is an attainable numerical value attached to the game (like you said) that can be achieved over time or the game is endless and you are forever improving your character. I once fell under the spell of getting achievements. There were several XBox Live Arcade games that were completely dead online (Bomberman and Puzzle Fighter to name two), but I would create a lobby and sit there for 5 minutes in hopes of someone joining my game just so I could get a 10 point achievement for playing a co-op match online. Yes, I thought those games were fun, but I wasn't playing for fun, I was booted those games up solely so I could get the lame achievement. In this case, it was "my job" to get those achievements. A fourth theory could be hope. You posted a picture of Final Fantasy XIII. Even though the last one I played prior to XIII was VII, I trusted the franchise and was a big fan of the Nintendo installs. 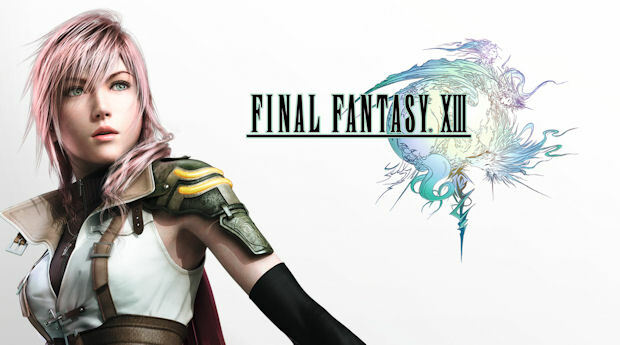 Personally, I think the first 95% of Final Fantasy XIII is one of the most boring games I've ever played in my life, but I kept playing in hopes that it would eventually get good. It eventually paid off, as I thought the last 5% of the game was fantastic. A high price to pay and I will never replay it from the start, but I still have things to do at the end game and I can see myself going back to it because I had genuine fun playing that part of the game. Last but not least, I'd like to explain what the difference is to completing a retro game and completing a modern game. It's not just the numerical value of getting achievement points. It's what those achievement points entail. 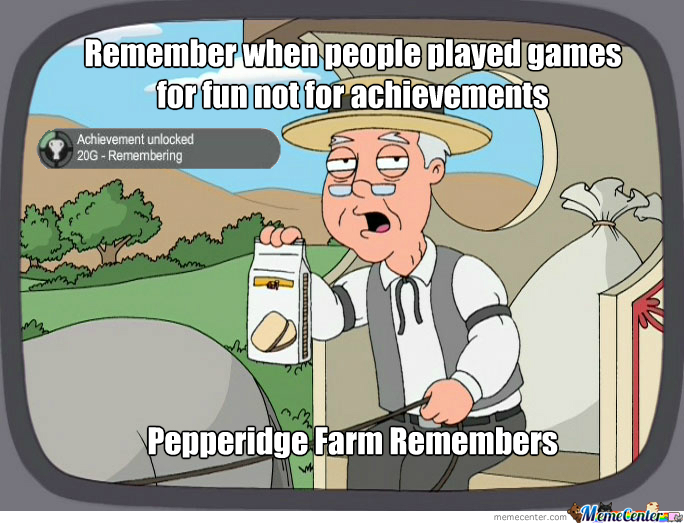 Most achievement points that aren't naturally achieved during the game are dumbed-down, mundane, time fillers that don't add anything extra to the game. Completing a random retro game, even if you think it's bad, is a little bit of a different story because of it's challenge (usually.) It's the challenge of a retro game, like Silver Surfer or Bart Vs. The Space Mutants that keeps you locked in. It requires 100% focus, almost as if the only thing in the world is you and the TV. You don't feel that in most modern games. You don't need focus to obtain an achievement whose requirements are generally 'find all the widgets' or 'do the thing you just did 100 more times'. @MetalFRO: I'm not hating on your gaming decisions or the Wii U, but I think people "look at you weird" because there are 2 powerhouse gaming consoles and then there is Nintendo, who has branched off in their own direction and is kinda just doing their own thing in the corner by themselves. The Wii and Wii U is almost a sub-genre of video games now, with their weird controllers, lesser graphics (I guess), multiple screens, and their weakness in the online multi-player world (which is the current state we're living in.) Nintendo is not normal anymore and the masses don't embrace the strange and unusual. @noiseredux: I agree here, I really enjoyed Suicide Squad. This definitely makes sense and rings true for me at least. I have been caught up in hype trains (Destiny), I have been disappointed (Destiny), and I have also been full-circle to the new mantra: don't pre-order games(can't stand by this 100% either). In general I have always formed my own opinion on things, and when I read reviews I try to think about what I would think of the game being described to me. I can sometimes read a review and find that points the reviewer are taking away from the game would actually be a plus to me, or the very least not negative in my point of view. Sometimes a game or movie will get panned across the board and I will watch or play it anyway, typically having a completely different opinion. Echoing the idea of the article essentially: form your own opinions, enjoy what you enjoy, and don't feel like you have to justify or quantify it. Forgot to add on what your major topic was. It'll be brief. I don't think the laws of groupthink don't apply to me because I already know what I like and what I don't like. I know I don't like most modern games and I know I love nearly all retro games. My vision is very narrow in that respect. Another great blog read Slackur! I only have a Wii U for now and I'm constantly mocked/chided for my choice of home console. As long as you are enjoying what game you're playing on whatever device you happen to own, then that is all that matters. Such a great article. Thought provoking and ever more relevant. Like Pam, I used to chase the cheevos. I would go to 360acvievements, print out the list and go after them one by one. Most of the time, I was playing games that I enjoyed but sometimes I just wanted the cheevo. I quit cheevos cold turkey and I'm a happier gamer for it. That's not to say that I think they are bad for everyone, I just don't want to chase that particular carrot anymore. I have a couple buddies who I talk games with and they spend a ton of time on reddit. I feel like when I talk games with them, they aren't telling me their opinion, they are passing off something they read on reddit as their thought. I've seen others call them out on it. "YOU GOT THAT FROM REDDIT" followed by a sly smile from the accused. One of the results of Groupthink is the rise of the anti-groupthinkers. A group of people who actively try to see things the way that a group thinker wouldn't. But does the anti-group thinking change the way you are thinking compared to the way you would have thought had there been no Groupthink group in the first place? I wonder..
Anyways. I don't care what anyone says. I like what a like, and you like what you like and that's awesome. Again, great article. @JerryGreenwood: I definitely think you're right, and I'd sort of combine reasons three and four. I know 'back in my day' when I couldn't afford a new game, I played whatever I got, even if I didn't like it much. If that much money was spent, there's the feeling that we have to get any entertainment we can possibly squeeze out of it until another game is available. Or perhaps instead of money, we keep playing because of, as you said, hope that the game will improve because something about it (say, its part of a popular series) compels us to play through it. I know several writers here have written up many a lore story about exactly that! @Gamer4Lyfe:Suicide Squad +1 (+2 counting my beloved) We had fun with it. She's more a Marvel Girl but we thought it was worth watching. @Link41: Thanks! And its funny, just about anyone who comes over wants in on Mario Kart 8 or Smash Bros, even those who grip about Ninty. @wildbil52: Thanks! We're probably all susceptible to Groupthink to some degree because that's just how we're wired; a huge amount of what forms our opinions (more than we'd ever realize) is really just someone else's input. The trick is to be honest about it, and be willing to analyze and break away if said input isn't constructive or healthy. At least, that's what everybody says. Groupthink is such a funny concept to me. I don't understand it, but I do find it funny. For example, how every few years the general opinion of Final Fantasy VII changes for whatever reason, or the funny look I get from people when I exclaim how stoked I am to get DQVII (today!) so I can play it on my 3DS ("I thought you owned a computer..."). Whatever. I'm pretty sure most people think I do this stuff to be different from the "mainstream" anyway. So, I'd like to add my voice to the chorus of "IlikewhatIlike" from some of the folks above. I am RFG; I like to kill mammoths in Tail of the Sun, stomp on two-eyed mouth-monsters with a pogostick in Commander Keen, grind levels monotonously with Inindo, and fly around space like an interstellar hobo in X3 - Reunion. There is no absolute truth in video games. Rock on, Simon's Quest. Oh, and by the by, great article, Jess.